The ilumi is one of the coolest connected home items we've seen. It's kickstarter-backed, produces any color you choose via smartphone, uses five times less energy than a normal bulb, and lasts for over 20 years. io9 readers can get 12% off ilumi – the lowest price online. 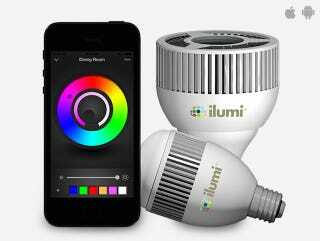 The ilumi fits standard lighting sockets, and connects to any Bluetooth-enabled iOS/Android device, with the free partner app allowing you to control hue and brightness. According to ilumi, a million different colors can be produced by blending the light from the LEDs. And that's all from a bulb that can last two decades, which is pretty impressive by itself. For $79 it's a very expensive lightbulb, but as it lasts you 20 years...this thing is pretty cool!